Students participating in ACE (Athletes for Excellence) get autographs and pictures taken with the legendary Joe Kittinger. Kittinger was the first man to free fall from outer space in 1960. He was a POW during the Vietnam war and his passion for balloons has furthered space exploration. Paraclete High School athletes participating in ACE — a four part leadership program — finished session three recently, and were definitely inspired by their speakers. Choices In Learning National Foundation announced Athletes Committed To Excellence Leadership Summit pilot program Jan. 24, 2017, and 125 students were enrolled. ACE provides high school students in-depth character building, leadership and mentorship training along with additional lifelong character development techniques, essential in future leadership development. According to Sports Illustrated, 78 percent of NFL and 60 percent of NBA athletes go bankrupt within two to five years of retirement. They knew the rules of the game, but not the rules of life. In ACE, students write a list of things that will both aid progress toward their goals and those that will deter or kill their ambitions, such as drug and alcohol abuse, not studying and hanging with the wrong crowd. When students are seeking scholarships and employment, they are reminded that those hiring, look at Face Book and can tell a whole lot about a person by their associations and tags. Students listened intently to Mark Norris, a businessman and helicopter pilot who hosted the event, Art Thompson of Sage Cheshire and A2ZFX, and the legendary Joe Kittinger, the first man to jump from outer space. “Actually, I’m quite amazed Mr. Norris trusts us kids around these beautiful cars,” said Nicholas Romanouski, 16, as he looked around at the collection of American muscle cars. Romanouski has been playing baseball for seven years and plans to follow in his brother’s footsteps and becoming a chiropractor. He spent last summer helping his brother in his New York office and will be going to school at New York University to pursue his career. Taylor Richardson, 15, plays volleyball and track while maintaining a 4.4 GPA. “I don’t let anything stand in my way,” she said. “Sure, I have set backs, but I don’t let them stop me.” The determined sophomore plans on attending the University of Washington and becoming a pediatric surgeon. “Students may be the best athlete and coolest kid, but after high school, these titles mean nothing if you don’t have integrity and character,” explained Norris. Transitioning to college, Norris told the students that they are not entitled to anything they didn’t work for, but they are entitled to everything life has to offer, providing they earn it. 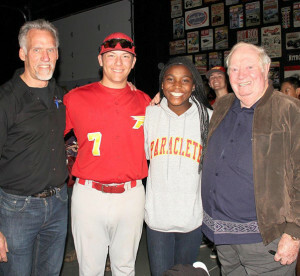 Art Thompson, designer and builder of the Red Bull Stratos capsule, Paraclete high school students Nicholas Romanouski and Taylor Richardson pose with Joe Kittinger during an Athletes for Excellence session. Romanouski has played baseball for seven years and plans on becoming a chiropractor. Richardson plays volleyball and participates in track, volunteers at the AV hospital in the pediatric ward and mentors Girl Scouts. She plans on becoming a pediatric surgeon and maintains a 4.4 GPA. Norris, a 30 year self-employed business man said he didn’t go to college and barely passed high school. He didn’t come from money, nobody handed him anything — he simply worked very hard and didn’t quit when things got tough. Wanting to be like the other kids in junior high school, Norris asked his mom for a pair of Concord black and white high-top tennis shoes. “We went to the shoe store and my mom said, ‘Marco, those shoes are $8 and we can’t afford them,’ so I didn’t get them.” He encouraged students to always pay their debts and not to buy things they can’t afford. Entering high school, he made several bad choices— including being a part of the wrong crowd, drinking and looking for fights with his buddies. For the last year and a half of high school he attended Desert Winds, a school for wayward boys. A couple of his friends were killed while drinking and driving. Guests felt honored to be in the same room as Kittinger and Thompson, the man that designed and built the Red Bull Stratos capsule that Austrian jumper Felix Baumgartner jumped from, breaking the sound barrier and almost knocking Google offline with over three billion viewers. Several students said that their parents and grandparents remembered Kittinger’s jump headlining the news in the 1960s — not long before Neil Armstrong stepped on the moon in 1969. Most of the students watched the Red Bull Stratos jump on their computers. Thompson compared Kittinger’s jump back in 1960 to Baumgartner’s jump in 2012. He also shared some of the projects he has worked on, including building more than 900 Red Bull Mini Coopers, being a part of the B-2 stealth bomber development, making parts for the F-35 Lightning II, building numerous props for blockbuster movies and commercials, including the recent vehicle that extends vertically and passes over cars. He holds several patents and touched on several projects that he could not fully disclose. “Joe had an open basket and a partial pressure suit — it’s what the pilots used in the day. Over that, he wore a snow suit and a whole lot of red duct tape,” explained Thompson. Thompson’s top of the line capsule and modified space suit kept Baumgartner safe. “Felix’s jump was uncomfortable, Joe’s was dangerous.” NASA and the U.S. Air Force are now using the changes Thompson made to the space flight suit. Having a curious mind, getting a formal education, standing his ground and not backing down, team work and having Kittinger as a mentor and partner, made the Red Bull Stratos flight a success, explained Thompson. One day while Kittinger and his wife were having breakfast with their friend Neil Armstrong, Kittinger asked Armstrong what was his most significant influence of his life. “He looked at me and said, ‘Joe, it was the teachers I’ve had. They took me from a person that knew nothing and gave me the motivation, skills and the thoughts — I owe everything to my teachers.’ You should be thanking your teachers every day, because they are working for your benefit,” said Kittinger. Kittinger said that his main goal in life was to be a fighter pilot and he worked at it constantly. Playing with airplanes at age five, he recalled getting a few C’s on his report card when he was in the third grade. “My dad told me if I wanted to be a fighter pilot, I had better start to do better in school,” and so he did. He knew the only way to reach his dream was to be a good student and have a proper education. Kittinger served three deployments to Vietnam and became a POW when his F-4 was shot down. His faith kept him going and after 11 months he was released. After retiring from the Air Force he had many accomplishments flying balloons and advancing space exploration. 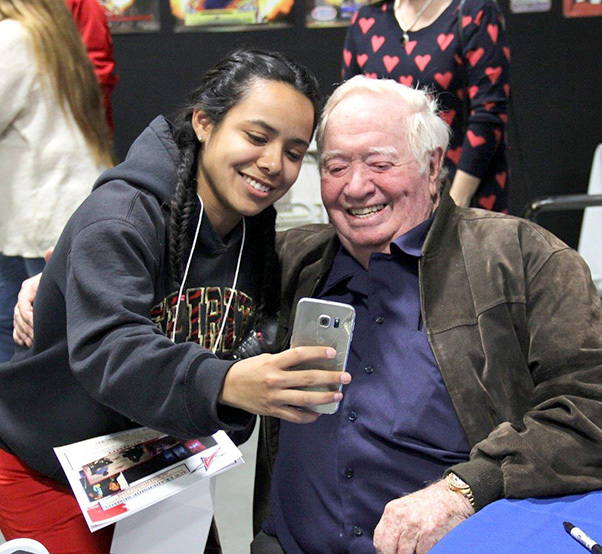 Some students Googled Kittinger while standing in line for autographs, and couldn’t wait to get home to share with their friends, many posting photos as soon as they were taken. The fourth ACE session will take place at the Pioneer Event Center in Lancaster in April.